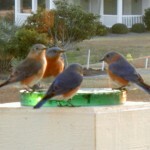 The bluebird family will stick around all winter and we will feed them worms and seeds. Then in the spring, the parents will chase the kids away before they start another family. Kinda like we did, except one family was enough.